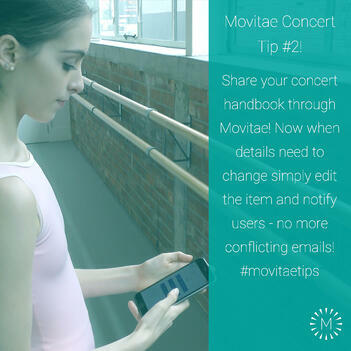 Here are 9 great tips for using Movitae over concert time! We'd love to hear your favourite ideas too! 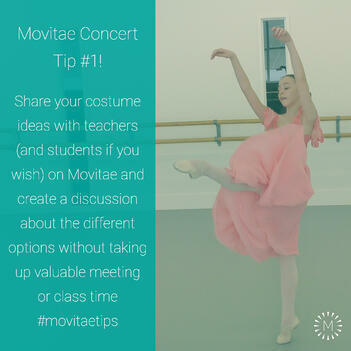 Tip #1 "Share your costume ideas with teachers (and students if you wish) on Movitae and create a discussion about the different options without taking up valuable meeting or class time"
Tip #2 "Share your concert handbook through Movitae! Now when details need to change simply edit the item and notify users - no more conflicting emails!" 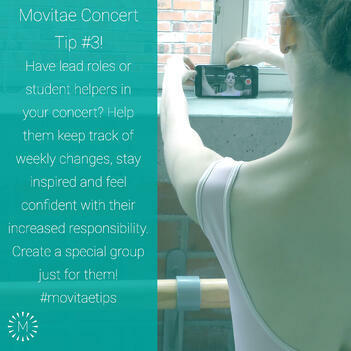 Tip #3 "Have lead roles or student helpers in your concert? Help them keep track of weekly changes, stay inspired and feel confident with their increased responsibility. Create a special group just for them!" 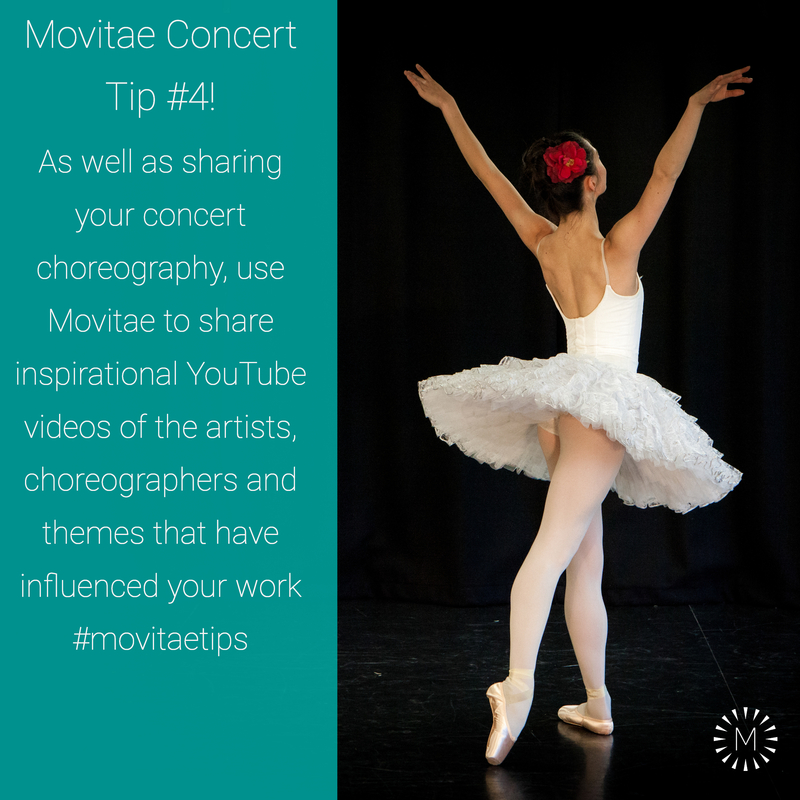 Tip #4 "As well as sharing your concert choreography, use Movitae to share inspirational YouTube videos of the artists, choreographers and themes that have influenced your work"
Tip #5 "Share your finalé choreography before the first finalé rehearsal, allowing students to arrive familiar with the steps!" 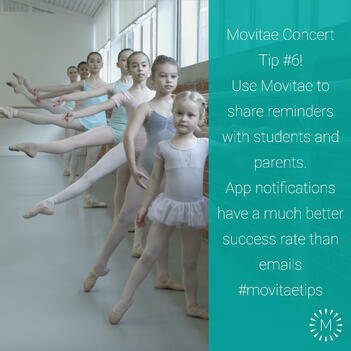 Tip #6 "Use Movitae to share reminders with students and parents. 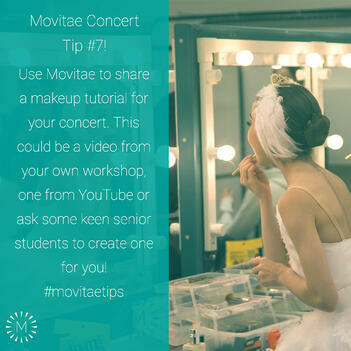 App notifications have a much better success rate that emails"
Tip #7 "Use Movitae to share a makeup tutorial for your concert. This could be a video from your own workshop, one from YouTube or ask some keen senior students to create one for you!" 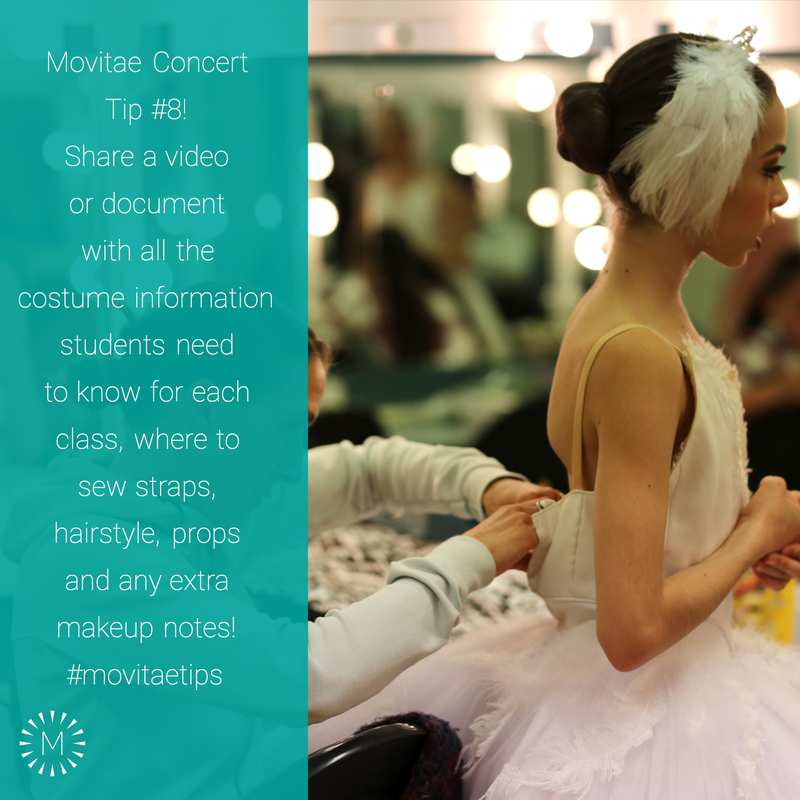 Tip #8 "Share a video or document with all the costume information students and parents need to know for each class, where to sew straps, hairstyle, props and any extra makeup notes!" 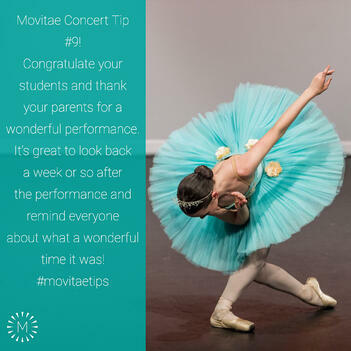 Tip #9 "Congratulate your students and thank your parents for a wonderful performance. It's great to look back a week or so after the performance and remind everyone about what a wonderful time it was!" 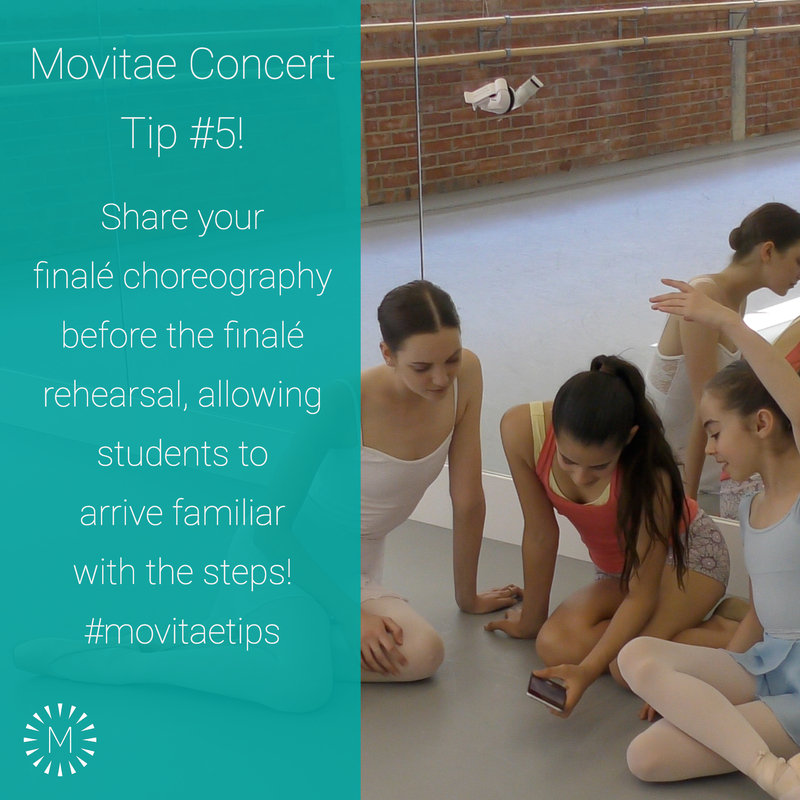 Click here to read 5 ideas to use Movitae for studio management.